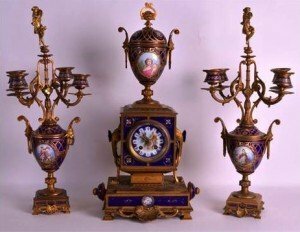 A fine 19th century sevres porcelain and ormolu clock garniture the blue enamel panels painted with classical scenes within a jewelled surround. An 18th century Chinese mandarin lozenge shaped vase qianlong, painted with figures within landscapes upon a dimpled ground. 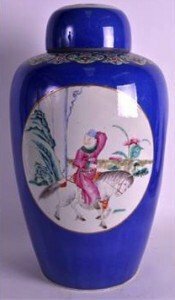 A 19th century Chinese powder blue ginger jar and cover bearing qianlong marks to base, painted with a figure upon a horse, under a banding of well executed foliage. 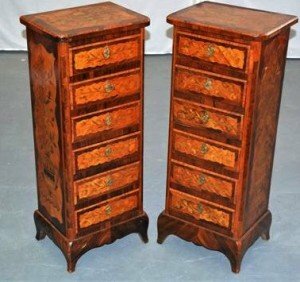 A good pair of early 20th century french kingwood cabinets inlaid with floral panels and vines to each drawer and sides. 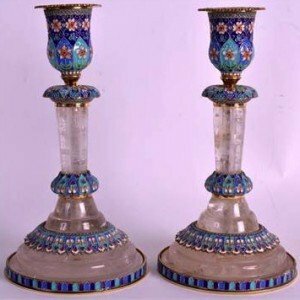 A pair of contemporary russian silver and enamel candlesticks supported upon a rock crystal body. 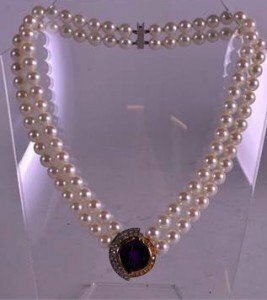 A lovely 1970’s 18 carat yellow gold ladies pearl necklace inset with a large amethyst encased with a two tone gold surround, decorated with diamonds. 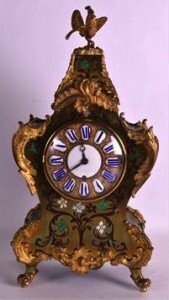 A 19th century boulle and ormolu mantel clock of rococo form with cockerel terminal, decorated with flowers. An early 19th century Chinese blue and white barbed bowl in the ming style, painted with stylised flowers and supported upon three feet. 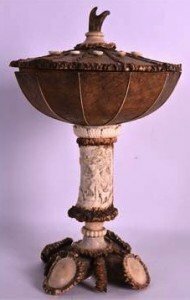 An unusual late 19th century bavarian carved bone cup and cover naturalistically formed, the stem carved with a hunter and hounds within a landscape. A pair of early 20th century Chinese famille rose bowls qing/republic, incised with foliage and painted with panels of precious objects. 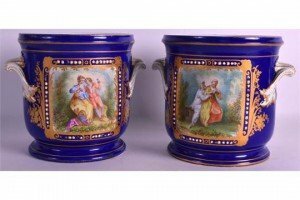 A pair of early 19th century sevres cache pots painted with classical scenes , within a white jewelled border. A 9ct gold iolite and diamond ring. The circular-shape iolite, to the brilliant-cut diamond trefoil sides. Estimated total diamond weight 0.10ct. 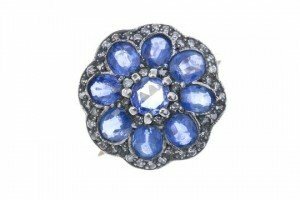 A sapphire and diamond floral cluster ring. 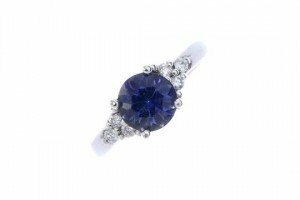 The circular-shape sapphire, within an oval-shape sapphire petal surround and single-cut diamond scalloped edge. 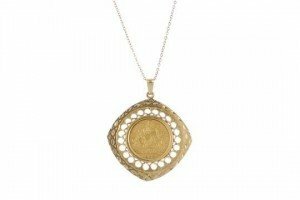 A 9ct gold half sovereign coin pendant. The half sovereign coin, dated 1902, within a kite-shaped openwork mount, suspended from a fine curb-link chain. Two brooches. 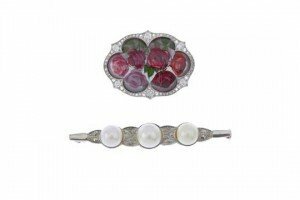 The first designed as three graduated cultured pearls to the textured bar, the second designed as a reverse carved intaglio depicting roses within an old and rose-cut diamond surround. 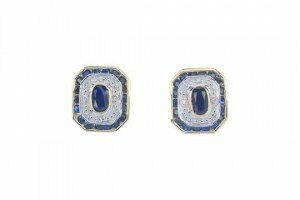 A pair of 9ct gold sapphire and diamond ear studs. Each designed as an oval-shape sapphire collet, within a single-cut diamond and calibre-cut sapphire double surround. 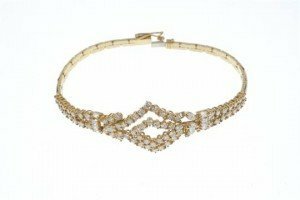 A diamond bracelet. Of bi-colour design, the brilliant cut-diamond, within graduated triangular-shape panels and circular-shape colourless gem line sides, to the push-piece clasp. 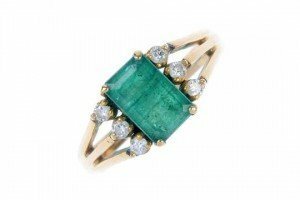 An emerald and diamond ring. The rectangular-shape emerald, with brilliant-cut diamond line sides, to the trifurcated shoulders. Estimated total diamond weight 0.15ct. A pair of garnet and diamond cluster ear studs. 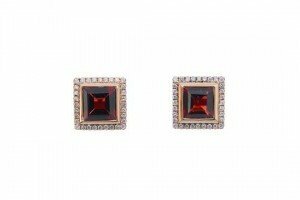 Each designed as a square-shape garnet within a brilliant-cut diamond surround. Back fittings deficient. Estimated total diamond weight 0.15ct. A diamond bracelet. Comprising two brilliant-cut diamond concentric kite-shape panels with baguette-cut and marquise-shape diamond sides, to the brilliant-cut diamond two-row terminals and fancy-link back-chain. Estimated total diamond weight 3cts.